I’m Mike Tarvin, from Tarvin Plumbing Company. Today, I’d like to talk to you about hand-showers. I’m going to try to demonstrate a few things without getting too wet. 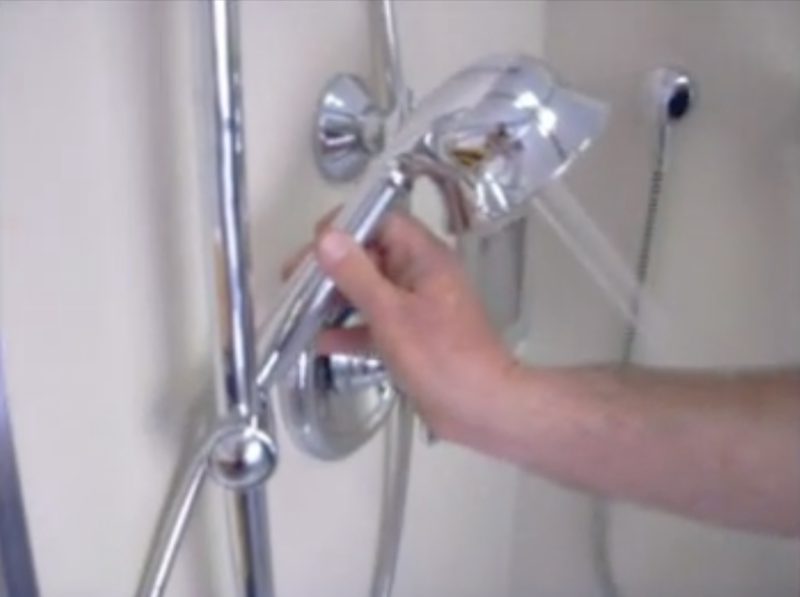 The easiest way to install a hand-shower is to install a fitting that’s called a diverter tee on the shower arm as it comes out of the wall. The diverter tee is basically a switch that diverts the water from the regular shower-head, though a hose to the handheld shower below. We are going to pick up the hand shower, turn the diverter tee, and water comes out of the hand shower! The hand shower then has different positions with different sprays, and fits into an adjustable bracket. That goes up and down, and right to left. If the diverter tee is something that you don’t want to have and would like to hide the diversion of the water to the hand shower, we have a different type of diverter valve that can be installed in the wall. the diverter valve then is turned and operates the hand shower by the turn of a lever of a canceled valve. So whatever way you’d like to add a hand shower to your shower, we’re happy to help you at Tarvin Plumbing.